It’s no secret that my family loves a good pasta dish! It’s our go to, easy dinner, especially when we want simple comfort food. And this Mediterranean Veggie pasta is a favorite. 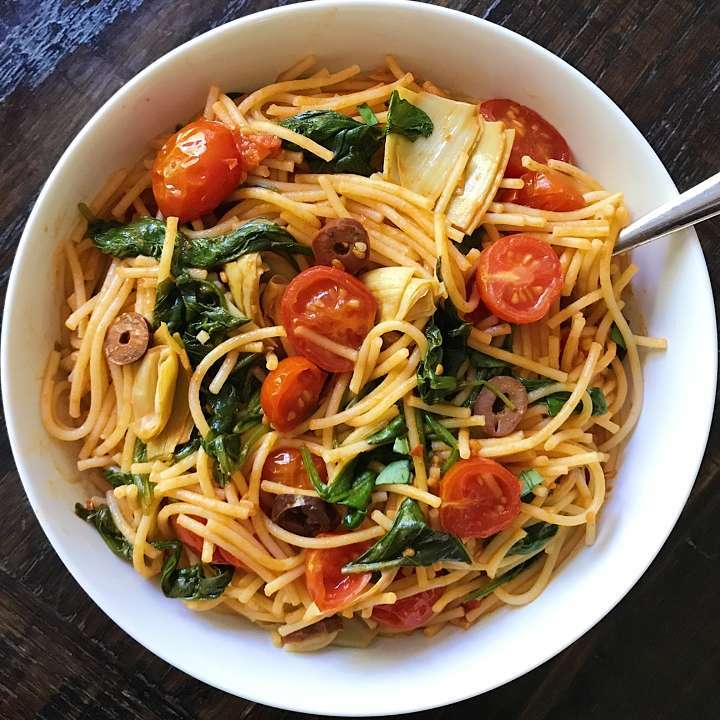 Cherry tomatoes, marinated artichokes, kalamata olives, fresh spinach and fresh basil sautéed and cooked up with gluten-free spaghetti (we used Barilla gluten-free this time), it’s super easy, super quick and super yummy! 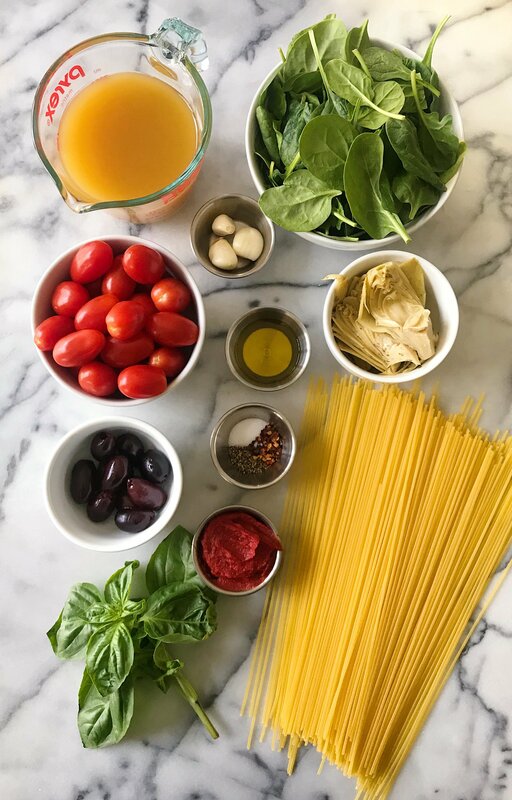 All you need… cherry or grape tomatoes, marinated artichokes, kalamata olives, fresh spinach, fresh basil, extra virgin olive oil, vegetable broth, garlic, salt, pepper, crushed pepper, tomato paste and gluten-free spaghetti. Recipe adapted from Cooking Light, we make this dish often because it takes less than 30 minutes, and we love that the pasta is added to the veggies and veggie broth for the last few minutes so it really absorbs all the flavors. I added artichokes and tomato paste to the original recipe. AND, I’ve finally answered a question we are asked so often… WHAT is our FAVORITE brand of GLUTEN-FREE PASTA? Click here to read the blog post and answer. Hope you love this dish as much as we do! Bring a large saucepan of water to a boil (without salt) . Add pasta; cook 8 minutes or until al dente. Drain in a colander. Set aside. Add pasta and simmer 2 minutes. If need more liquid, add hot water or more broth as needed. I tried this and it was delicious! I added a few sprinkles of brown suger. Dont tell anyone! When I was sauteeing the red pepper flakes and garlic, the flakes became burnt almost instantly. Thoughts on why? Made this tonight and enjoyed it so much! I love the crushed red pepper flakes in it and added a lil extra. This will definitely be one of my go to meals regularly! Thank you as always for creating such easy but healthy dishes! So happy you love it as much as we do Cindy! I love extra crushed red pepper flakes on my plate as well!